I'm outta here everyone - I'm currently away for a short break with the kiddies up in sunny and hot Brisbane! But the best part about my absence is that I have lined up some of my favourite Aussie bloggers to keep you busy for the next five days. There are so many awesome Aussie bloggers that it was so hard to narrow it down to just a few to guest post, but I'm sure you will agree that I've chosen some fantastic and fun ladies to entertain you. You should also check out our Gumleaf Mafia website to see a feed of blog posts from all the Aussie blogger members. My first guest blogger is Kristy from The Polish Haven. I can't even remember when it was that I first started 'chatting' with Kristy, I remember seeing her beautiful swatches and NOTD pictures on MUA and I was so excited when she started her blog last year. Kristy has been my mule many a time, but particularly in getting me Chemistry polishes from South Australia, which allowed me to complete my Ozotic/Chemistry #500 and #600 series. She has created many a lemming for me, and I think today will be another example of that! Take it away Kristy! Hey all, hopefully Cathy is enjoying some well earned time away at the time you are reading this. Since Cathy's discovery of colour morphing pigments for frankening back in August last year there have been lots of indie polish makers including these magical pigments in their creations and today I have a special one from Ninja Polish called Alexandrite that appears to have the blue-->green pigment AND the teal-->purple colour change glitter that is found in Ozotic Elytra 528 and Hits Moonbow. Application was fine and dry time was pretty good, the wear time on this one has also been fantastic. WOW, isn't that polish amazing and aren't Kristy's photos stunning! Thank you so much Kristy. 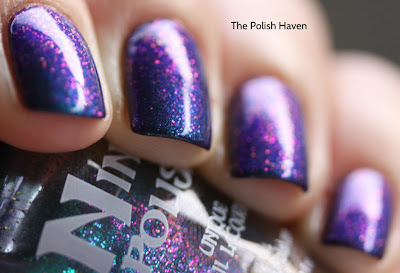 Please go and show Kristy some love over on her blog - The Polish Haven. Great photos, great guest, great polish. Such a perfectly named color - one of my favorite gemstones. Thanks Kristy for such a lovely post. Oh wow, SO gorgeous. Adding to wishlist! I have this polish, and it's just as gorgeous as described! It's one of those polishes that is more artwork than simple nail polish. These pictures are beautiful! That polish has my favorite colors wrapped into one--so pretty!